→Bulletproof Profits Review – Scam or Guaranteed Success? Bulletproof Profits Review – Scam or Guaranteed Success? The founder of Bulletproof Profits is claiming you can easily make $2,000 per day online by leveraging a secret goldmine. What is this goldmine all about? Is Bullet Profits another scam or can you really make lots of money with this system? 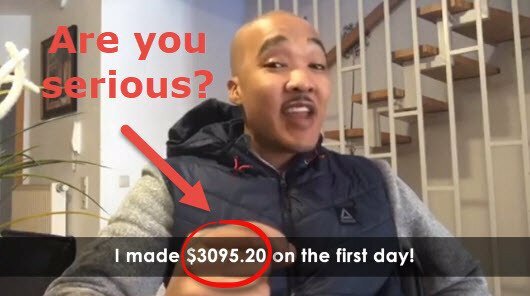 The creator of Bulletproof Profits is trying to convince you that he discovered a unique money-making loophole that you can use to generate thousands of dollars per day. Start Making Up To $3,750Today With Just 7 Simple Clicks! 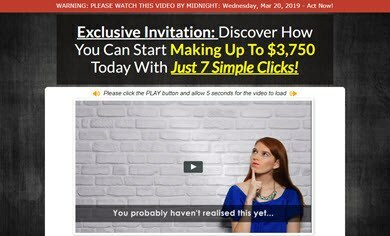 Sure you will never be able to start from zero and make thousands with just 7 clicks unless you win the lottery. According to this website, you don’t need any special skills or huge time commitments to start making money online. There are many testimonials of people who achieved remarkable results, including a guy who claimed to have made $3095 on his first day. I have reviewed lots of Clickbank products that use fake testimonials such as CB Wealth, and Cash Formula. If Justin was able to make so much money in such a short time, why would he bother creating Bulletproof Profits to teach others how to do it for just 9 bucks? Why not use the same system to replicate his success over and over and quickly become a billionaire? Well, the truth is that the system is not unique nor bulletproof, and there are no guarantees you will make any money. Bulletproof Profits is an online course that will show you how to make money with Amazon FBA as well as the Amazon affiliate program. With the Amazon FBA, the strategy involves buying cheap products from wholesalers in China, for example, and resell them via the Amazon fulfilment program. As for the Amazon affiliate program, you will earn a commission when someone clicks on your affiliate link and purchase a product on Amazon. In this case, you are not the seller, only the marketer who is promoting other people’s products in exchange for commissions. Both are robust strategies that many people have been using to generate a full-time income from home for years! However, it’s not as easy as they make it seem. You will need to work much more than 15 minutes per day to grow any type of internet business. There are lots of valuable content. With the Amazon FBA, you will need to buy products which are not guaranteed to sell. Competition can be very high, reducing your profit margin significantly. Bulletproof Profits consists of many video tutorials that will help you start operating your Amazon FBA or affiliate business. I’ve seen many courses for sale on Clickbank, and I can tell you the amount of valuable information they provide is above the average. You will also learn different strategies to generate free traffic such as Youtube, Pinterest, Instagram, among others. For just $9, you are getting a ton of value! Justin guarantees that you will get the success you desire. So, there you have it! The founder of Bulletproof Profits shouldn’t make claims of guaranteed success since any business opportunity entails a certain level of risk. You should not expect overnight success wither either an Amazon FBA or an Amazon affiliate business. Besides, you should be prepared to lose money in the process as you can buy products that don’t sell. Bulletproof Profits offer a 30-day money back guarantee, so you can ask for a refund if you don’t like the training or business model proposed. Conclusion – Is Bulletproof Profits a Scam? Bulletproof Profits isn’t a scam because it provides some valuable information to start and grow an internet business. The main issue here is with the way this product is being advertised. In my opinion, it gives people unrealistic expectations and the wrong mindset to succeed. The training is very affordable, and there is a 30-day money back guarantee if you don’t like it. However, it’s important to understand that you will need to work very hard to compete on equal terms with your competitors in your niche. There are no guarantees, but if you are highly committed, you can succeed eventually. In 2015, I discovered an excellent training program that showed me step by step how to build a website, attract an audience, and earn affiliate commissions. Thanks to my mentors Kyle and Carson, and the hard work I put into this business, I am now very close to quitting my job and living life on my own terms. I am not rich, but I think the possibility of working whenever and wherever is incredible! Support from me, the owners and the entire community of knowledgeable internet marketers. It’s a great place to build passive income sites! But of course, so you will need to put in the work just like everybody. I hope my Bulletproof Profits review was helpful to you. If you have any questions, feel free to leave me a comment below.